From the moment you step into your Platinum or Gold Class cabin, you can leave your credit card safely tucked away knowing that all food and beverages are covered by your All Inclusive fare – from magnificent gourmet meals prepared by our professional chefs to that cheeky nightcap waiting on your bedside table at the end of the day. Boasting deluxe extras such as Platinum Transfers, in-cabin breakfasts and access to the Platinum Club, Platinum Service promises and delivers a journey beyond expectations. Step out of your spacious cabin and into the Platinum Club where an all inclusive menu is prepared by on-board chefs using fresh local fare. Our seasonal menu features mouth-watering dishes such as saltwater barramundi and grilled kangaroo fillet. Platinum Service fare includes hearty breakfasts, two course lunches and three course dinners. Vegetarian, children’s and limited special dietary meals are available when you make your booking. You may also choose to complement your meal with our selection of wines and beverages included in your fare. 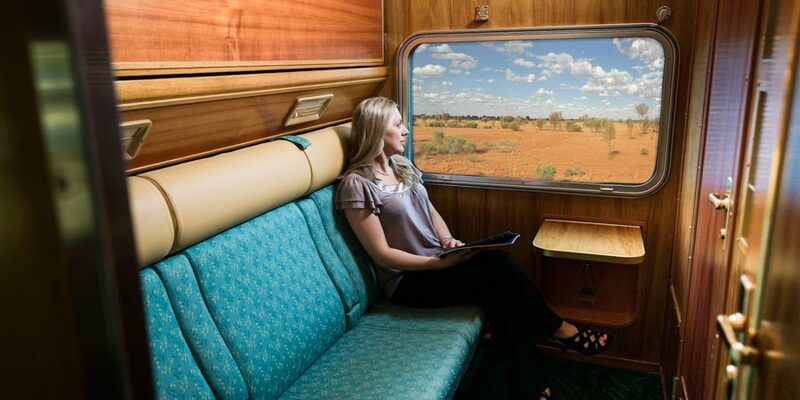 With room to stretch out and all the comforts of home, Gold Service is the most popular level of service aboard The Ghan. You’ll enjoy private cabin accommodation together with all-inclusive dining, beverages and a range of fascinating Off Train Excursions at key stops. Gold Service accommodation is available in both single and twin-share so you can choose to travel with your partner, friends or roll solo. The exclusive, classically styled Queen Adelaide Restaurant Car features an all inclusive menu, prepared by on-board chefs using fresh local fare. Our seasonal menu features mouth-watering dishes such as saltwater barramundi and grilled kangaroo fillet. Platinum and Gold Service fare includes hearty breakfasts, two course lunches and three course dinners. Vegetarian, children’s and limited special dietary meals are available when you make your booking. You may also choose to complement your meal with our selection of wines and beverages included in your fare. Fares are subject to availability and may not be available on all services. Gold Superior cabin fares available on request. Fares and timetables are correct at time of publication and are subject to change without notice. *Please note: All times are local time and may be subject to change. Guests must be at the terminal at least one hour before train departs.